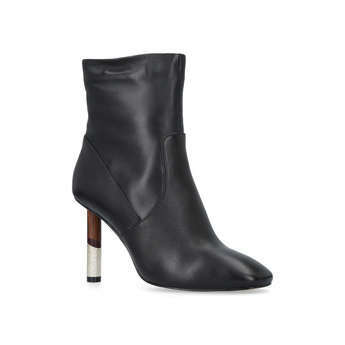 For a Halloween-worthy buy that’s so much more than a one-wear wonder, it’s all about a pair of pointy black boots. 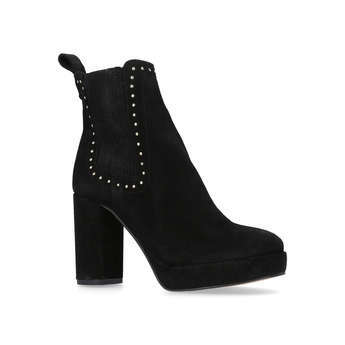 Carvela Kurt Geiger’s 'Sandy' is a fierce stiletto-heeled shoe-boot that’s perfect for pairing with sleek leather leggings and a Victoriana blouse, while Carvela Kurt Geiger’s pearl and stud-adorned 'Sparky' kitten heel boots will add a high-fashion finish to a can’t-go-wrong witches costume. Fashion editor and influencer Laura Fantacci is giving us major Halloween outfit inspo, wearing her Carvela Kurt Geiger 'Scrunch' boots with a red and black striped knit and leather mini. 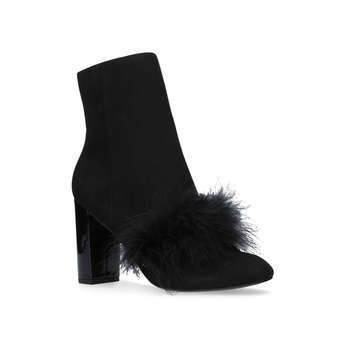 Halloween-ready heels come in the form of Miss KG’s pom-pom trimmed 'Sasha' and Carvela Kurt Geiger’s 'Acid' courts – just the ticket for topping off a cat woman costume. On the accessory front, bags that err on the chic side of novelty are the order of the day – check out Kurt Geiger’s glitter-covered heart cross body or keep it classic with the eagle-adorned black leather 'Mini Kensington'. Guys can get into the Halloween spirit without going all-out on the fancy dress front with Kurt Geiger’s 'Charlie' trainers and their pumpkin-hued sporty sole. Giving it your best Dracula this Halloween? You’ll need a pair of slick black flats. May we suggest Kurt Geiger’s 'Gingers' loafer or the patent 'Dermot' lace-ups. Both are fashion classics you’ll have in your wardrobe for seasons to come. If you want to make sure your little ones are the most stylish trick or treaters on the street, look no further than Mini Miss KG’s AW17 collection. Halloween kicks don’t get better than Rockstar, a silver glitter skate shoe featuring a monster face and tuft of fluffy hair, while the faux fur trim on Mini Lovely is perfect for little werewolves! Less scary but equally amazing are the 'Shooting Star' high tops in cool black or sparkly silver. Going for an animal-inspired costume? Top it off with 'Twit Twoo', our super-cute gold glitter high tops with an owl face tongue. If she’s desperate to go as a witch, give her outfit a cool edge with the 'Mini Swish' studded bikers – they come in adult size too FYI.